On Tuesday, Radiohead frontman Thom Yorke, singer for one of the biggest and most influential rock bands in the world, will release his debut solo album, “The Eraser.” The question, of course, is why? And more specifically, why now? This seemingly simple and musically reasonable step has, inevitably, been cause for speculation and bewilderment about the future of his multiple Grammy-winning group of sonic avatars, especially due to the fact that none of his band mates perform on it. (There are, however, sampled fragments of the band’s music on the disc: the chopped piano sample heard on the title track that opens the disc, for instance, was originally played Jonny (cq) Greenwood and recorded by Yorke on a dictaphone). Yorke himself seems acutely aware of the consternation his solo move might cause, and has sought to defuse tea-leaf reading rumors that “The Eraser” is a signal that the Oxford band might be breaking up. He tried to keep the work a secret until after Radiohead went on tour as a way of preventing speculation that the demise of his group was imminent. (That effort failed when the entire album was leaked online more than a month before its official release). Yorke even went so far as to forewarn the water cooler crowd and blogger obsessives not to make too much of it. And yet “The Eraser” *is* without question a Yorke solo album; a mostly solitary exercise, an exorcism of creative autonomy. Yorke has said that much of the material for “The Eraser” grew simply out of boredom, as well as a long-lingering, inchoate desire to try something different with the sounds he heard in his head and saved as files on his laptop. Wisely, he enlisted longtime Radiohead producer Nigel Godrich to help make his errant, videodrome dreams cohere. And in some ways, the disc *is* more cohesive – in a traditional pop sense anyway – than the more abstract Radiohead outings that sealed its reputation as an updated aesthetic link between Pink Floyd, Can, and Brian Eno. “Please excuse me but I got to ask,” Yorke queries with uncharacteristic, Prince-like coyness on the title track. “Are you only being nice because you want something?” It’s a surprisingly blunt question from a man whose spent the past decade obfuscating them. With a restless, longing lyric framed by an edgy arrangement of bustling percussion and spooky, creepshow synths, “And It Rained All Night” is a four-minute portrait of urban desolation, inspired by a New York City rainstorm. “Black Swan” is constructed on a clipped, quietly taut riff, a restrained neo-funk sketch drawn on a less-is-more groove. Sure, the by-now-familiar skittering electro-bleeps, synth burbles are here, but Yorke’s impressionistic voice, which he has always treated as just another instrument in the mix, has never been clearer or more direct. 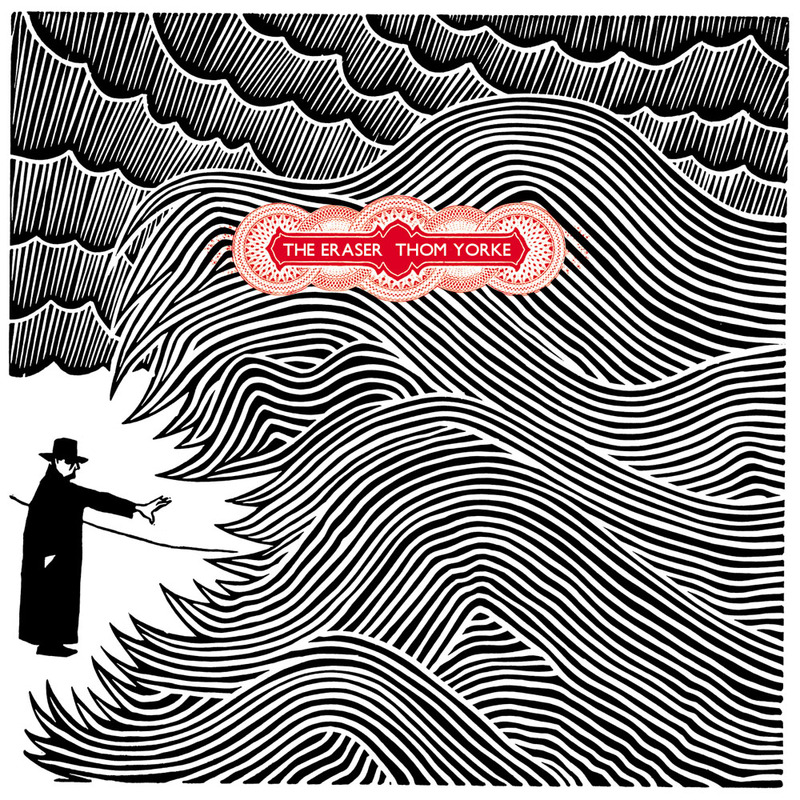 Here, it’s scrubbed dry of its usual reverb bath and moves to the melodic forefront of muted, substantively slight tracks such as “Analyse” (cq) and “Atoms For Peace.” Nevertheless, this *is* Thom Yorke and not Bono we’re talking about, so a palpable sense of free-floating, perpetually dissipating ennui remains. Or, as Yorke himself puts it on “Harrowdown Hill,” one of “The Eraser”’s strongest tracks built on a snapping bass riff, “I feel me slipping in and out of consciousness.” Indeed. Maybe the impetus for “The Eraser” was truly something as banal as this: Yorke just needed to get it out of his system, literally and figuratively, simple as that. Let’s not forget that the desire to experiment, to move beyond familiar terrain and the safety of convention has always been Radiohead’s principal guiding force and modus operandi, even dating back to the days of its breakthrough single and ubiquitous MTV hit, 1993’s “Creep” – which, at the time, was dismissed (along with the band) as a flashy bit of alt-rock fluff with a disaffected lyric and coolly stuttering guitar hook, nothing more. Improbable as it might have seemed at the time, Radiohead managed to shed that one-hit wonder image by by releasing “The Bends,” an audaciously ambitious follow-up, in 1995. From there, it shed radio-friendly rock music altogether with a trio of genre-disregarding meditations (“OK Computer,” “Kid A,” “Amnesiac”) that carried a current of internal paranoia and communicated profound alienation. For Radiohead, glacial silences, not guitar solos, were the means of creating its dystopic universe. At Radiohead’s most courageous (some detractors would say self-indulgent), the band expressed its willingness to risk losing a chunk of its audience early on, and in doing so issued an implicit long-term challenge to it: dare to come with us and embrace new terrain, new ideas. This strategy, if it can be called something as calculated as that, gave listeners more credit than most rock bands – especially these days – give their audience, or even themselves: that exploration and an open mind are the keys to artistic growth, or at least, the next adventure waiting to happen. By that measure, Yorke’s desire to take a detour from his day job and make “The Eraser” is completely in keeping with this ethos. Unlike the vanity solo projects undertaken by pop stars eager to feed their egos or revive their faltering careers, Yorke’s motives appear genuine, modest even. “The Eraser” feels much more like a personal side project than the launch of a solo career. And with a new Radiohead album reportedly in the works, the clear message from this most cryptic of bands seems to be this: that neither Yorke nor his continually metamorphosing outfit are departing anytime soon. One of my original copies of “Exile” and one of the most iconic album covers of all-time, using both images shot by photographer Robert Frank for his landmark book, “The Americans,” as well as new pictures of the band shot by Frank on location in California and New York). 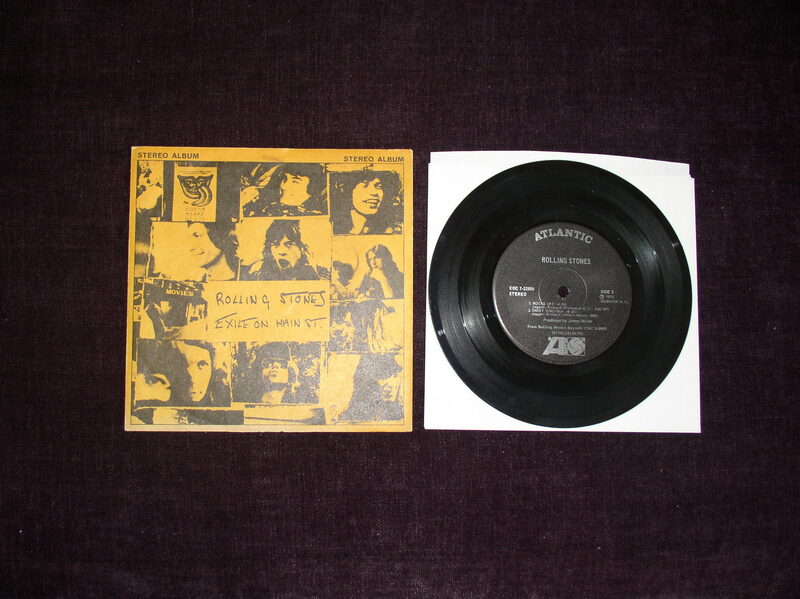 This is a very early and possible first pressing that came in a distinct uni-pak style jacket (both LPs slid into the inside of the opened front jacket flap) and also included 12 attached/perforated postcards of the band horsing around in costume (bassist Bill Wyman didn’t make the photo shoot, so someone took his place). 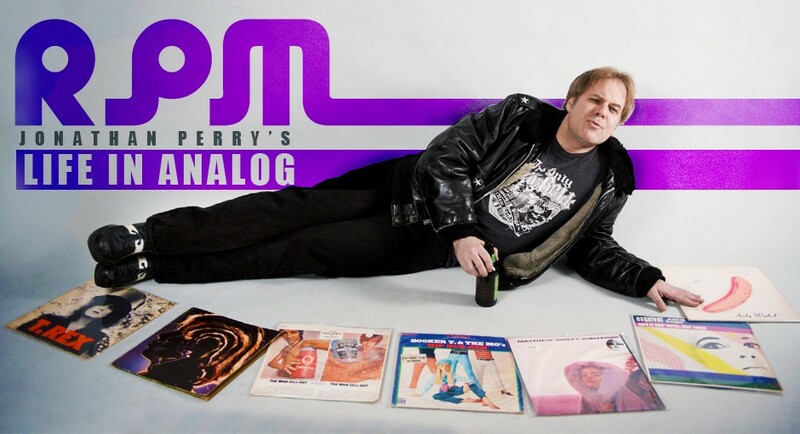 Later pressings did not include the postcards and had standard double-LP gatefold sleeves. 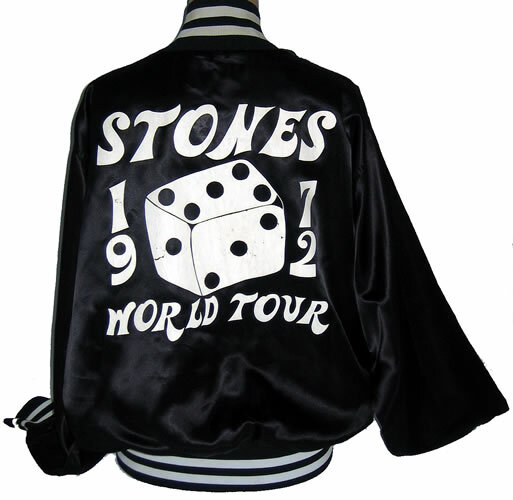 This is my Jagger-designed silk tour jacket specially given out only to the band and road crew/tour members during the 1972 tour in support of “Exile On Main St.” The striking black and white color combo was picked so the members of the Stones Touring Party could be easily spotted in any arena or venue. Of course, this stuff (and the attendant merchandising) is routine now, but this jacket was a predecessor for the major rock tour gear of the 1970s and beyond. Not available to the public, and one of the gems of my Stones collection. It was there, even if I was not. 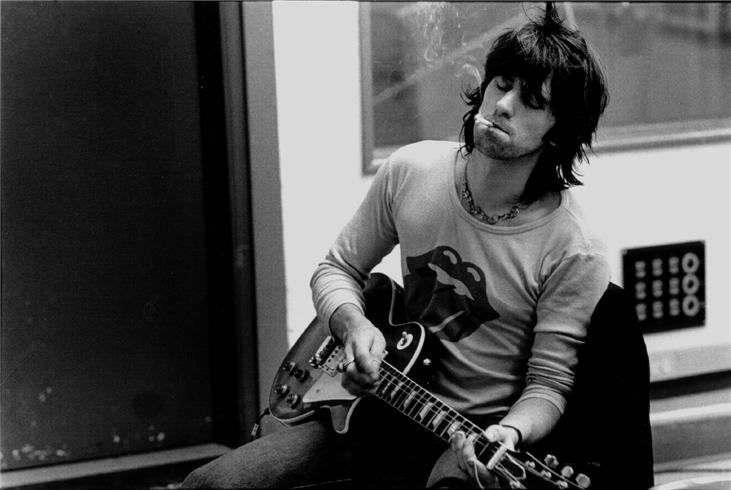 Keith Richards plays a riff during the “Exile” recording sessions, Sunset Sound studio, spring ’72. Photo by — who else? — the great Jim Marshall. A detail of Robert Frank’s images taken from the cover of the “Exile On Main St.” cover. Yeah, we know. The guy second from the left is sorta troubling. 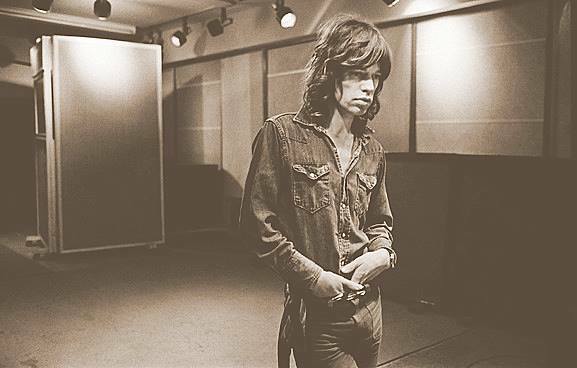 Mick Jagger, Sunset Sound studio in California, early 1972. Photo taken by the great Jim Marshall, whose recent book, “The Rolling Stones 1972,” is a must for fans. Here’s my four-song jukebox (remember those?) EP that was issued only for, um, full-size and those mini pizza restaurant jukeboxes. Not available for public sale in record stores. Very rare cover and EP from my personal collection. Coinciding with the deluxe reissue a few years back of the Rolling Stones’ “Exile On Main St.”, I pitched a piece to The Boston Globe on what that blearily beautiful sprawling double album meant to me growing up amid corporate FM radio of the late 1970s and early ’80s, and how it (and the Stones) helped not only shape my perspective of rock music — and music, period — but restored my faith in what great, meaningful rock & roll could, and should, be. I wrote most of this essay by hand in a notebook during a four-hour train ride from Boston to New York City, while listening “Exile” a few times. Since a few kind folks have periodically asked for copies of this piece since its publication in The Globe in May 2010, I thought I would post my slightly longer “director’s cut” version here to mark the album’s original May 1972 release and the band’s iconic U.S. “STP” (Stones Touring Party) jaunt that began in June and lapped its tongue and lips around America for a surprisingly short (by today’s standards) two months. The Stones finished up with a three-night stand at New York City’s Madison Square Garden, culminating in a final show July 26, Mick Jagger’s 29th birthday. I’ve also included a few photos of my rare and unique “Exile”-related memorabilia that didn’t make it into the paper. Those should be showing up somewhere in this space — that is if I don’t screw it up. Ah, no matter. Chawlie’s good tonight, inn’it he? Paradiddle me in willya Mr. Watts? Thank you kindly. Here’s the piece. 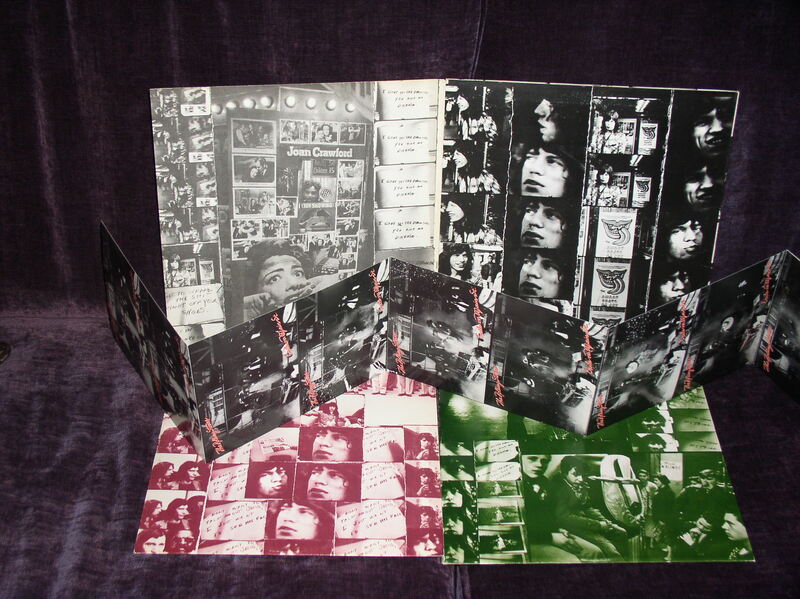 Let’s get this out of the way: “Exile On Main Street” is not the Rolling Stones’ best album. But it may well be their most important. For cohesion and expertly executed songcraft, my vote would go to Jagger’s choices, or to my favorite, 1971’s “Sticky Fingers.” But “Exile” is easily the most talked-about, obsessed-over, mythologized work of the band’s nearly 50-year career. There have been many Stones reissues to hit the market over the years, often shrewdly timed to a new tour or technology. But none in memory have matched the anticipation and nostalgia stoked by next Tuesday’s deluxe re-release treatment of “Exile,” which will include 10 previously unreleased tracks, as well as some reworked “Exile”-era songs. For several generations of fans and critics (most of whom have radically revised their initial assessments of the album), the Stones’ 1972 opus remains the band’s definitive, enduring statement. But why “Exile?” Was it the band’s stew of R&B-marinated rock (“All Down The Line”), back porch country (“Sweet Virginia”), Saturday night blues (“Stop Breaking Down”), and Sunday morning gospel (“Just Wanna See His Face”)? Was it photographer Robert Frank’s conic black & white cover art depicting a melange of carnival freak-show images mixed in with grainy film stills of the Stones hanging out on the streets of L.A. and New York City? Was it the bleary, just-woke-up-or-never-went-to-bed quality of music that suggested a rolling, tumbling house party in sprawling slow motion? Or was it the toxic aura of decadent glamour that hung over the whole affair, one littered with hangovers and hangers-on? The debauched rock-star mystique, personified in a single inside-sleeve photograph of Mick and Keith leaning like blood brothers into one overhead microphone, singing as they clutch their liquid libations? It’s classic Stones iconography – a snapshot of inspiration from deep inside the woozy womb of what one imagines to be an endless bacchanalian bash. Yes, yes, and yes. Never mind that, upon its release in May of ‘72, “Exile” received mixed reviews, or that Jagger has long refuted it as the Stones’ masterpiece, or that the seedy basement where much of it was recorded was actually situated in Keith’s sumptuous villa in the south of France. “Exile” is a sweeping distillation of the Stones’ sybaritic strengths and a consolidation of all of the band’s musical influences, aspirations, and debts. For the first time, instead of being young European outsiders earnestly paying tribute to the older blues musicians they had idolized, the band sounds fully immersed, totally *inside* of the music, a part of it rather than a pose. As a result, “Exile” is the most authentically American music the British-born Stones ever made. When people talk about that signature Stones “Sound,” this is the era and album they are referring to, trying to emulate (e.g., Wilco’s “Being There”) or even respond to (Liz Phair’s “Exile in Guyville”). Like many others who were born in, rather than defined by, the decade that birthed the likes of the Stones, the Beatles, Bob Dylan, and the Who, I fell under “Exile”’s spell many years after it was first released. It wasn’t my first Rolling Stones album, but to my teenage ears it felt and sounded like the most adventurous, inscrutable, grown-up music I had ever heard. Its gritty, world-weary disposition was, I imagined, the soundtrack to a life experience that was the polar opposite of my shy, sheltered existence growing up in a tiny rural town in Western Massachusetts. It was also a bracing tonic to the corporate claptrap clogging mainstream radio at the time – homogenous drivel like Styx and Asia and, the worst offenders, Loverboy – that to me were emotionally and musically soulless. Only later would I be initiated into the thriving punk and nascent alternative rock that was, also at the time, bubbling up from the underground. From the moment I lowered the needle on my cheap Zenith Allegro stereo onto “Rocks Off,” the boisterous opening track, and sat down on my shag-carpeted bedroom floor, positioned squarely in front of those bulky speakers, “Exile” hit me like a locomotive. I threw myself headlong into the vinyl grooves and lived there for weeks. The four sides of that double-LP would eventually send me backtracking, scrambling to answer Mick’s query on “Hip Shake”: “Whaddya know ‘bout Slim Harpo?” Decades later, I’m still discovering how long “Main Street”’s road runs, how deep into the country it goes, and how many twisting detours – peaks and valleys of rhythm and groove – there are along the way. Ultimately, that’s also the true, enigmatic power of “Exile”: Its emphasis on conjuring moods, riffs, and atmosphere, rather than dispensing radio-ready rock ‘n roll songs. Even the album’s first single, “Tumbling Dice,” sways more than it stings. Like Dylan’s “Blonde On Blonde,” another double album of some repute, “Exile On Main Street” is bedrock music that is at once a product of its special time and place, and a living, breathing work that transcends those specifics. “What a beautiful buzz, what a beautiful buzz,” Jagger observes on “Loving Cup,” a line about fleeting contentment delivered with a measure of wonder and – for Jagger – rare sincerity. But there’s a sense of fretful urgency too, a doomed desire to capture and document the nocturnal moment before it vanishes with the dawn. Who knew the buzz, still beautiful, would last another 41 years?